Jaipur, July 15: The Tonk district of Rajasthan Friday noon witnessed infamous brutal khaki boots entering the mosque and unleashing rein of baton attack on the Namazis (who were offering Friday prayers). One person died in police attack inside the mosque while more than 50 others got serious injuries. A similar condemnable attack took place more than one and half years ago in Goplagarh district of the state – more than 10 Namazis were killed in the police firing. A representative delegation of Muslim organizations and civil rights groups on Sunday visited the Police Chhaoni area of Tonk district, met victims and members of other community besides Collector and Inspector General of Police of the region. Er. Rashid Hussain, a member of the delegation said it was a repeat of Gopalgarh. Though police claimed, he said, that some Muslim youths had first pelted stone on the police team kept vigilant outside the mosque, the retaliatory action of the police was far more brutal and cannot be justified. On Thursday night (July 11) a baraat (wedding) part was passing by a mosque in Tonk district. Members of the wedding party were playing DJ in full volume – and this was reportedly objected by some Muslims. This led to minor clashes and stone pelting on each other. However, it was controlled by the elders of the two communities – and soon everything was normal. But what happened next day (Friday) looked planned to teach a lesson to Muslims. As during Ramazan, a good number of Muslims visit mosque to offer prayers everywhere in the country. There is an old mosque in Police Chhaoni area of the district. The managing committee was making extra arrangement for the namazis on the first Friday. But this was rumored as Muslims were planning for retaliation and thus large contingent of police and paramilitary forces were deployed in the area surrounding the mosque. Soon after the Friday prayer, some youths came out of the mosque and as per police, they pelted stone on the police team. But what police did in response was simply brutal and unwarranted. The police surrounded the mosque, they fired tear gas shells inside the mosque and then 60-100 policemen entered the mosque and started mercilessly beating the Namazis. One person named Nasir, 35, died on the spot while over 50 people got serious injuries. A tear gas shell hit a child’s eye inside the mosque and his eye came out and fell on the floor. 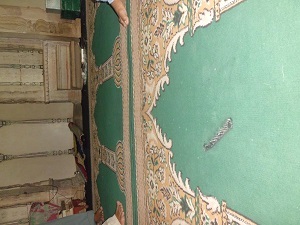 The fact finding team found tear gas shells and its impact near the member (the central place in the front row of the mosque where the Imam leads prayers). The nine-member delegation had representatives from Rajasthan Muslim Forum, Sadbhavana Manch and People’s Union for Civil Liberties. 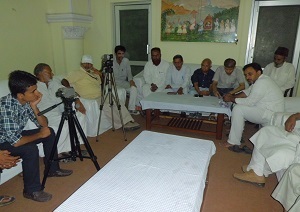 The delegation members included Er. Khurshid Hussain of Jamaat-e-Islami, Nazimuddin of Rajasthan Muslim Forum, Prof. Ratan Singh of Rajasthan Muslim Forum, Sawai Singh of Sadbhavana Manch, Er. Rashid Hussain of Sadbhavana Manch and Satish Kumar. The delegation has demanded a high-level probe into the incident and adequate compensation to the victims. They raised doubt over the motive behind the incident when the election is round the cornor.